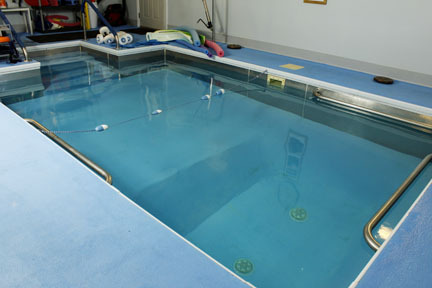 Eberle's Physical Therapy, Inc. is different from other physical therapy offices in that we offer aquatic therapy. This type of therapy helps with pain reduction, improves strength, helps range of motion and other positive benefits. Those that are suffering from back pain, arthritis, and other conditions where it is painful to exercise while on land, would most benefit from aquatic therapy. The buoyancy of the water works in the opposite direction of gravity making you feel lighter and less pressure will be felt on your joints. We offer this therapy in a 10 x 15 ft pool heated to 95 degrees. We provide both weight bearing and non-weight bearing activities. Call us today for more information and to learn how you can get started.